Since its inception in 1976 the Marcus and Mark H. Trumbo Excellence in Teaching Award has served to recognize the finest work of Aurora University full-time faculty (clinical and tenure tracks) in their roles as teachers, mentors, and transformative scholars. 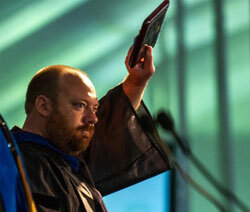 The prestige and value of the award is recognized by the University community and has a positive impact on the teaching practice of faculty colleagues, making Aurora University an institution of higher learning that provides opportunities for students to thrive academically and developmentally. 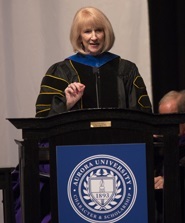 The university's dean of faculty development presents the Marcus and Mark H. Trumbo Excellence in Teaching Award to a deserving member of the Aurora University faculty each May at commencement. 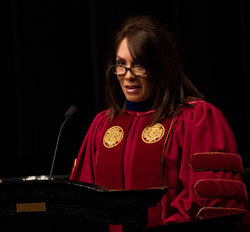 The most recent recipient provides remarks at the Honors Convocation the following spring and thereafter supports student learning across the university through facilitation of faculty development sessions. The recognition includes a monetary award, a plaque, and an engraved name plate on the Marcus and Mark H. Trumbo Award for Excellence in Teaching achievement board. Dr. Sarah Radtke, assistant professor in the School of Education and Human Performance, teaches athletic training and interdisciplinary courses. Radtke earned a MSEd in Exercise Physiology and an EdD in Adult and Higher Education from Northern Illinois University. Passionate and dedicated to student learning, Dr. Radtke has served as advisor to the Spartan Athletic Training Students Organization and on several committees on campus. As a teacher, Dr. Radtke takes pride in mentoring students and is described as being always available to them to discuss academics or options for further educational opportunities. Dr. Radtke is known for her ability to design and implement inclusive learning environments which allow students to thrive. Dr. Toby Arquette teaches in the fields of communication, media studies, and interdisciplinary studies. Prior to joining the faculty of Aurora University in 2007, Dr. Arquette was on the faculty at DePaul University, Purdue University, and Loyola University Chicago. Dr. Arquette’s research in communication infrastructure and telecommunication economics and public policy has been supported by the National Science Foundation (NSF), the Centers for Strategic and International Studies (CSIS), and the Social Science Research Council (SSRC). Dr. Arquette has also been actively involved in intercollege speech and debate as both a competitor and coach. While at Aurora University, Dr. Arquette has chaired the Department of Communication and co-directed the Aurora University Honors Program. Before accepting the post of Executive Director of the Dunham School of Business and Public Policy, Dr. Arquette served as the Chair of the Faculty Senate. As a teacher, Dr. Arquette strives to balance rigor with compassion. Dr. Arquette is known for creating challenging learning environments that push students to their limits with the goal of always finding thatnext level of excellence for a student no matter where they begin. Dr. Arquette models the behavior and professionalism that he hopes to inspire in the students he teaches. Dr. Sharon Miller teaches in the physical sciences and interdisciplinary studies. Prior to taking a position in the Physical Sciences Department in 2011, Dr. Miller acquired years of research experience in the fields of medical device development, tissue engineering, and pre-cancerous biomarker development. Her earned degrees in materials science and biomedical engineering from Purdue University and the University of Michigan allow her to bring design principles and technical skill to her courses. At every level, Dr. Miller strives as an educator to share and learn with her students how our natural world works and how humans continue to be daring and curious in our quest for knowledge. Her students comment that her classes are “challenging” and “make you think”, while she remains “respectful, fair, and helpful”. She enjoys pushing her students to synthesize and present concise but detailed information and viewpoints while pursing big, and often difficult, questions about their surroundings. Dr. Miller challenges students to be elastic as learners when combining their critical thinking skills with purpose, resourcefulness and innate curiosity. Dr. Stephanie Whitus joined the AU faculty in 2007. Having taught for California State University, Texas A&M University and the University of South Carolina, she chose AU because of its smaller class size and opportunity for student mentoring. Dr. Whitus strives to create a classroom environment that is professional, hands-on and minds-on, where she encourages risk-taking in learning. She wants students to be prepared to respond in an educated way to life's issues and challenges, and she thrives as a life-long learner who continues to grow and develop with her students. 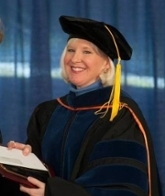 Dr. Whitus' research interests include such areas as the scholarship of teaching and learning, death- and life-sentenced populations, exoneration and wrongful conviction, violent offending and offenders, program and policy evaluation, and issues related to conducting research within the field of criminal justice. She has developed three Special Topics courses: Capital Punishment, Serial and Mass Murder, and Criminal Profiling, and recognizes that experiences outside of the classroom can enrich and reinforce academic learning while also contributing to the community. This includes collaboration with community organizations to conduct research, volunteer experiences that deepen course learning, internships that assist with networking and career decisions, and additional creative methods for sharing the university’s depth of knowledge with the community. Dr. Whitus advises ACJA (Aurora University Criminal Justice Association), and upholds a pedagogy that promotes a life comprised of a continuous search for knowledge and the development of leadership expressed in the teaching, mentoring and encouraging of students. Dr. Joan Erickson teaches special education literacy courses in the School of Education. The core of her beliefs as an educator is that learning to read changes the lives of children; continuing to read changes their lives forever. Prior to coming to Aurora University in 2008, Dr. Erickson spent 19 years at the University of Nebraska-Lincoln, where she taught and conducted research in literacy development and instruction. Since beginning her career as a teacher educator, she has received the Albert J. Harris Award from the International Reading Association for conducting research that made an outstanding contribution to the understanding of prevention or assessment of reading or learning disabilities. 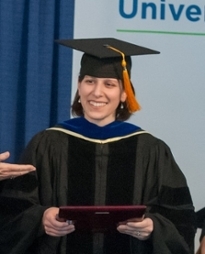 In addition, she has received the Donald R. and Mary Lee Swanson Award for Teaching Excellence and the Distinguished Teaching Award from the University of Nebraska College of Education and Human Sciences, as well as an Excellence in Teaching Award from the University of Notre Dame and the Crystal Apple Award from Michigan State University. She co-advises PEEPs (People Engaging Exceptional People), a student organization dedicated to improving the life experiences of individuals with disabilities. Dr. Donovan Gwinner teaches composition, literature, and interdisciplinary studies. Before joining the faculty of Aurora University in the fall of 2004, he taught as a post-doctoral fellow at the University of Oregon, his undergraduate alma mater, and at such institutions as Washington State University-Vancouver, Portland Community College (in Oregon), and the University of Arizona, where he earned his master’s and doctoral degrees in English Language and Literature. Increasingly, he regards college students as survivors of an educational régime dominated by bureaucrats, bean counters, and bunglers. He delights in helping students to develop their own critical perspectives and to articulate their own thinking effectively. Dr. Gwinner emphasizes student-centered instruction, providing guidance as the classroom leader but giving students the opportunity to lead discussions and generate ideas. He encourages and challenges students to be active and self-directed in pursuit of their education. Dr. Deborah A. Stevens joined the Aurora University faculty in 2001 as an assistant professor in the School of Education. She developed and taught classes at all levels from undergraduate to graduate courses. For Dr. Stevens, teaching is the cornerstone of her work and impact means contributing to the development of teacher candidates and the larger audience including in-service teacher practitioners and the community as a whole. As a professor, Dr. Stevens assists teacher candidates in becoming critical thinkers, as they construct meaning, learn to question and not just accept educational policy, learn to be resourceful and self-directed, work to demonstrate passion and advocacy for the students they teach and to become fully devoted and committed toward having a positive impact on society. Her students describe her as "motivating to do the very best" and "she wants us to achieve to be the best teachers that we can be and after taking her class...how can you not be?" and "it's a tough class, but I have taken a lot more from it than any other methods class." The Jeanne Norris Award for Excellence in Teaching was established in 2013 to recognize outstanding teaching by faculty at George Williams College. Dr. Norris has a passion for all things GWC. She served as a faculty member and academic leader from 1959 to 1985 before returning to her summer home in Maine to live on a year-round basis. Dr. Norris earned undergraduate and advanced degrees in the fields of Music, Education, and Physiology from Boston University and Loyola University. As a multi-talented teacher and a lifelong learner, Dr. Norris infused her work with intellectual curiosity and an intrinsic commitment to excellence. Generations of George Williams’ students benefitted from her high standards and her willingness to help them realize their full educational potential. Several years ago, the Leadership Service Award was established by the Board of Trustees to pay tribute to members of the faculty and staff who exemplify the university's core values of integrity, citizenship, continuous learning and excellence. In 2004, the award was rechristened the Tony Olejnik Leadership Service Award in memory of a professor who served first on the faculty of George Williams College in Downers Grove, Illinois, and later as a member of the psychology department at Aurora University. During his many years of service, Tony distinguished himself as a colleague, mentor, teacher and friend. This award is presented on behalf of the Board of Trustees by the Provost. The John McKee Citizenship Award was established in 2009 by longtime Aurora University Board of Trustee member, John F. McKee. This award – one for an AU faculty or staff member and one for a student – was created to affirm the university’s commitment to the values of integrity, citizenship, continuous learning, and excellence. The award reflects Mr. McKee’s lifetime commitment to “service before self,” a principle that has guided his work as an AU trustee for over 40 years and in his involvement and service throughout the Aurora community. The award is presented to a member of the AU faculty or staff who has demonstrated outstanding citizenship and is actively engaged in a community service beyond his or her role at the university. Nominations are accepted from students, faculty, as well as the general Aurora community. A monetary prize is awarded to the recipient and a matching gift is given to the organization of the person’s choice.